With the increase in the use of the internet, it is obvious that the good and the bad of the internet are bound to increase as well. Till some time back, acquiring viruses was just a desktop and a laptop problem but ever since our phones have become smart, they are at a higher risk of getting dumb through viruses. Ironic, I know but the smarter our phones will get, the more vulnerable they will be to lose their genius. To make sure that that does not happen, we need to take protective measure immediately as prevention is better than cure and the best way to do so is by downloading an app called Avast, which is a mobile security and anti-virus app. Avast Mobile Security with free antivirus for Android secures against unwanted phishing, malware, spyware, and malicious viruses such as trojans and even against loss or theft. Secure your phone and tablet with our top-rated free mobile security app with both antivirus and anti-theft protection. It is completely free and is available in more than 20 languages. – Security tools like virus scanner, virus removal, protector, network meter, app manager, app lock, and even firewall (on rooted phones) give you total control for staying clean. – Protects against general infections, app vulnerabilities and Wi-Fi-based threats to your OS. – Locate lost phones or tablets through web-based phone locator feature. – Remote lock and memory wipe features (just two of its many advanced Anti-Theft components) keep your data safe from theft. – Antivirus Engine: Virus scanner automatically scans installed apps, memory card content and new apps upon first use. Schedule automatic scans for when you sleep. Includes SMS/file scanning for complete mobile protection, and also protect against avg spyware and removes viruses. – Privacy Report & Apps Manager: Provides insights about installed apps and helps you understand your apps’ access rights, intentions, and permissions. – SMS and Call Filter: Allows you to retain your privacy. Block numbers from those you do not want to be able to contact you. – Web Shield: Blocks malware infected links, as well as trojans, adware and spyware (for safe web browsing) and even USSD numbers (which have the ability to wipe your device’s memory). Also fixes mistyped URLs. – Network Meter: Measures incoming/outgoing data transfers. – Firewall (rooted devices only): Blocks hackers from getting in. – App Locking: Locks any two apps with a PIN/gesture (unlimited in Premium). Backup: Allows backup of contacts, SMS/call logs, and photos (Premium version provides backup of music, video, and apps). – Locate your phone on a map using GPS tracker. – Lock device, activate siren, or wipe memory to keep your private data safe. Get notification of a SIM card change. – App Locking: Locks an unlimited number of apps. – Ad Detector: Detects ads and provides full details of their tracking systems. – Password Check: Automatically locks after 3 failed attempts to unlock. Remote SMS: Remotely send text messages from the phone. – Remote Data Recovery: Remotely retrieve data from the phone. – Remote Identification: Take picture of the thief when he/she tries to unlock it (using front or back camera, with face recognition). Record audio, with voice recognition. – Backup Features: Allows backup of video, audio, and apps (including settings and data for rooted phones, e.g. game progress). Premium pricing (auto-renewal): $1.99 monthly, or $14.99 yearly. 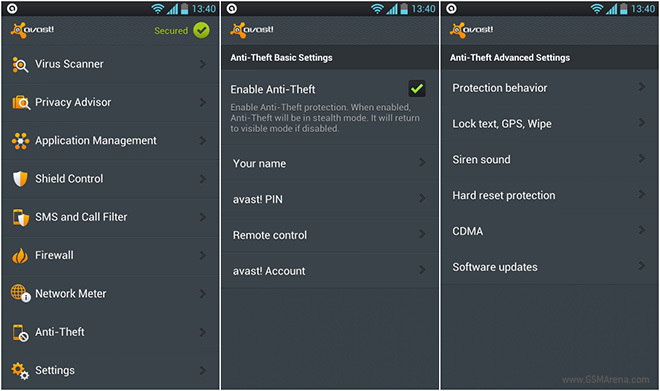 Avast is one of those few security apps thats has a very holistic take on mobile security, in every sense of the word. Therefore, it proves to be one of the saftest options for our beloved smart phones.